The new car rental facility at Cleveland Hopkins International Airport. Gullwing lights used at the new rental facility. A temporary bridge used during the Cleveland Hopkins International Airport project. The liquid hydrogen transfer facility at Cleveland Hopkins airport. The rocket testing facility at Cleveland Hopkins International Airport. Cleveland Hopkins International Airport, which is located in Cleveland, Ohio, US, underwent a $1.5bn expansion and renovation programme during 2001-05 to increase its capacity to meet growing travel demand. In 2010, it handled 9.49 million passengers. The airport, which is owned by the City of Cleveland, is a hub for Continental Airlines. International destinations including Canada, the Caribbean, Mexico, Puerto Rico and the UK. The airport has received an exceptional rating from Federal Aviation Administration six times. In 1997, a masterplan was formulated, based on the most important requirement – a new parallel runway that could facilitate electronically aided simultaneous takeoff and landing operations. This runway, 6L-24R, became operational in early 2004. 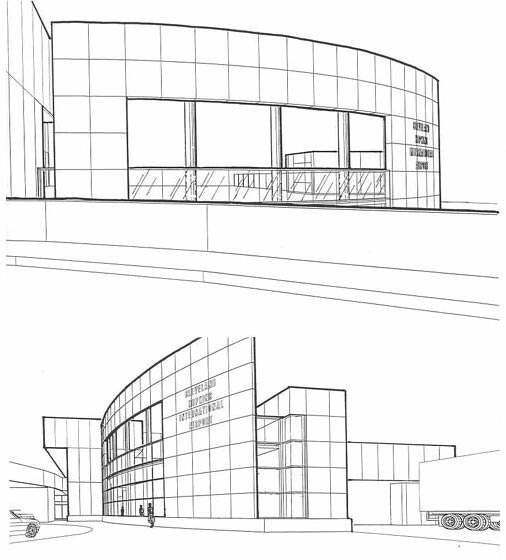 As well as a new runway, the masterplan included improvements to the terminal, parking garages and roadways. A new deicing facility and a maintenance centre were commissioned in 2002. A major problem faced by the Program Management Team – a joint venture partnership headed up by Parsons Transportation Group, a US-wide construction company – concerned the airport’s location. "Over $60m was invested to protect the valuable natural habitats around the airport. " Cleveland Hopkins airport is surrounded on all sides by the Rocky River Reservation Park and Gorge to the south and west, Highway I-480 and State Route 17 to the north, NASA Glen Rocket Engine Test Facility (RETF) to the west, and State Route 237 and Ford Motor Engine and Assembly Plant to the east. Expansion outside the airport boundaries was not an option. Over 20 projects were identified to overcome the many obstacles facing the construction of the new runway in the existing area. It included the relocation of some NASA buildings and several surrounding businesses in Brookpark Road. The relocation project started in 2001 and was finished in 2004. Over $60m was invested to protect the valuable natural habitats around the airport. When construction was completed, more than 350 acres of wetlands and 30,000ft of streams had been preserved. Federal Aviation Administration invested $69m for construction of a new ATC tower and TRACON radar facility in the airport. Funding of the $1.5bn project has come from many sources, including the City of Cleveland, (Federal, State, local and user communities – involving a federally backed $149m letter of intent), general aviation revenue bonds, passenger facility charges and airline-supported rates and charges. Cleveland Hopkins International Airport has three runways: 6R/24L, 6L/24R and 10/28. Runway 6R/24L is 3,034m long and 10/28 is 1,834m long. The new runway at Cleveland Hopkins is 1.3 miles in length and allows up to ten more takeoffs and landings an hour. "Several new parking facilities were constructed as part of the airport upgrade." With the addition of the TRACON facility, the airport’s overall capacity increases from 80 takeoffs and landings per hour to approximately 120 when required by operation capacity requirements. The new runway also facilitates quicker takeoffs and landings, limiting the waiting time for planes both on the ground and circling in the air. This helps reduce delays to passengers and airline costs. The runway environment has also become safer, by reducing the need for planes to taxi and manoeuvre across runways. It is hoped that this increased capacity will also attract more budget carriers. The 6L-24R extension to the south has eliminated the need for incursion onto the crosswind runway 10-28 during airfield operations, which has greatly increased safety. Following the extension of runway 6R-24L the parallel runway to the south no longer needs to interact with the crosswind runway. The contractor for the construction of the runway was Anthony Allega Cement Contractor, Valley View, Ohio. The contract for this part of the project is estimated to be $130m. Runway 10/28 is to be extended by 330m. The FAA will grant $18m for this project. Doan Pyramid Electric won the contract to install the electrics for the new runway. This amounted to 1.9 million feet of No 85kV field cable, 160,000ft of 500 MCM 15kV feeder cable, 68,000ft of No 1/0 5kV power cable and 60,000ft of fibreoptic cable. The primary power supply was redistributed from steel towers to separate concrete-encased underground duct banks and a new electrical vault and 138kV substation was built. The new runway is classified category III (CAT III), which allows pilots to use it in very low visibility. 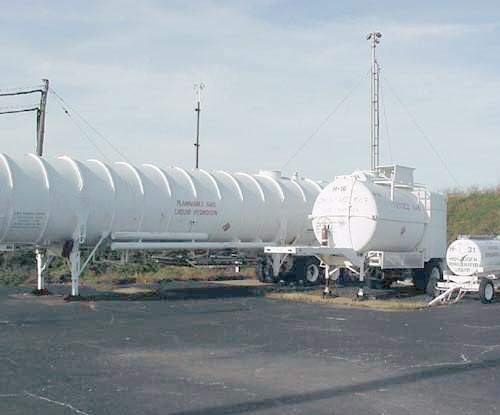 The FAA has installed navigational instrumentation, which was commissioned in 2004. Additional instrumentation has also been installed to allow Simultaneous Offset Instrument Approach (SOIA) landing and ground control, thus completing the full capacity increase needed by operations. SOIA instrumentation uses a state-of-the-art radar precision runway monitoring system, of which fewer than 12 are currently in use in the country. In addition, a surface movement guidance control system has been installed to enable surface traffic to navigate to and from the terminal in low visibility. A state-of-the-art computerised control and monitoring system has upgraded existing and new runway lighting control. All of this work was completed and in operation by February 2005. 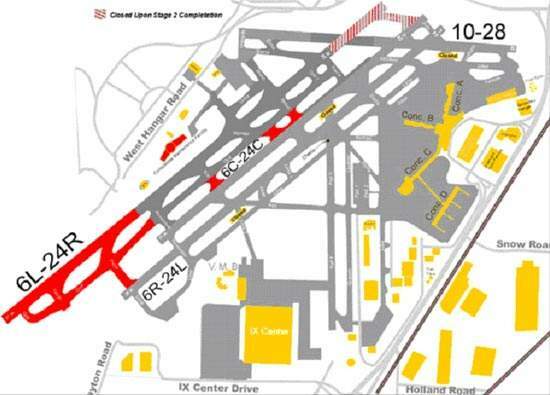 An Engineered Material Arresting System was installed at both ends of runway 10/28 in mid-2011. EMAS is used to prevent an aircraft overrun. Several new parking facilities were constructed as part of the airport upgrade. One consisted of the construction of new 2,400-space and 1,400-space parking structures, totaling 1,168,000ft2, as well as a new passenger bridge. The architect for this project was URS Greiner & Desman and the general contractor was Donley Inc, of Cleveland, Ohio. This project was completed in 2003. "The masterplan also included improvements to the terminal, parking garages and roadways." Donley was also responsible for a new 17,440ft2 consolidated rental car centre that houses eight rental car companies and 1,250 cars. This was designed by VS Architects and was an aggressive fast-track project completed in less than six months. 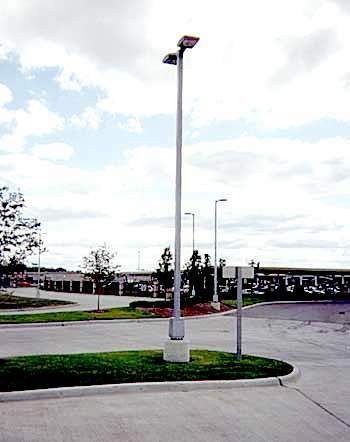 Lighting for this facility was provided by The V Group, Cleveland, Ohio, which used Gullwing lights to allow for maximum light levels with a minimal number of poles. Another new 1,500-space covered parking lot – the airport fast park – was built by DAS Construction, at a cost of $10m. DAS also performed demolition of the existing parking and site infrastructure, site development of the parcel, a 3,600ft2 operations and maintenance building, and the design-build-construction of a 436,000ft2 covered parking structure. 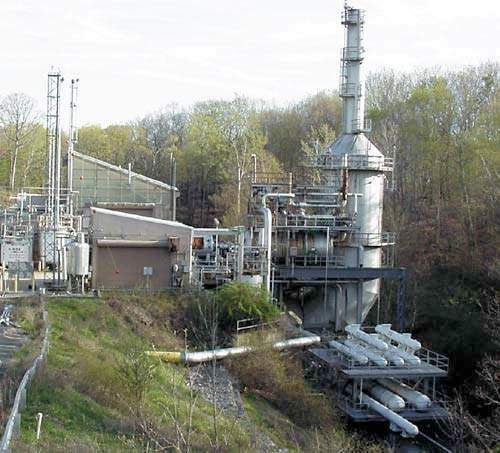 $2m of the $10m project was spent removing chemicals from the property. Half & Associates, of Dallas, was the project coordinator. An expansion project allowing for the design and construction of a 27,200ft2 baggage claim area on the northeast end of the existing terminal building was recently completed. Other projects include improvements to concourse connectors and mall areas, with 24 added speciality shops and restaurants and new signage in and around the airport. A new visitor information centre is located on the baggage claim level. "A new visitor information centre is located on the baggage claim level." The completion of runway 6L-24R is just one milestone in the five-year expansion project. The project has already involved a major land swap between the cities of Cleveland and Brook Park. NASA Glenn became part of Brook Park in exchange for the IX Center (expo centre), which will be torn down in preparation for a further runway that city officials believe will be needed by 2014. To make way for this proposed runway, 468 homes in Brook Park will be purchased by Cleveland and demolished over the next 11 years (this is highly controversial and there have been lawsuits over compensation; the airport has set aside $75m for purchase of property outside the airport confines for expansion activity). Other suburbs surrounding the landlocked airport are receiving financial assistance to insulate about 13,000 homes against the noise from more frequent flights. Flex-O-Lite's exclusive Type III high-performance glass beads are engineered to provide outstanding visibility in airfield markings, guaranteeing the utmost safety on runways and taxiways at airfields around the world.